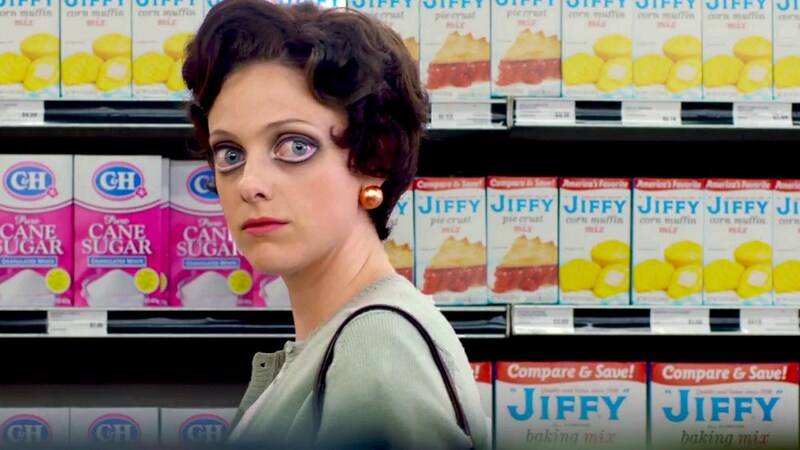 Big Eyes was a big bust at the Oscars this past awards season. An early frontrunner in a lot of categories, it failed to even earn a nomination in any group; a disappointing end to a buzz-filled run. It did well at the Golden Globes, winning a Best Actress award for Amy Adams and producing a Best Actor nomination for Christoph Waltz. But everyone knows that the Academy Awards are where it’s at, and Big Eyes didn’t succeed where many originally thought it would. Call it a snub if you will, but this film’s lukewarm reviews mark it less as an Inside Llewyn Davis oversight or Selma insult, and more as a failure to capture the best this intriguing true story had to offer. In the end, all we have here is a good movie that couldn’t stand up to the competition, let alone sweep it away. Margaret Keane was, for many years, America’s most famous secret artist. Her story starts in the 1950s when a divorcee with a child was a pariah, even in San Francisco. But Margaret had left her husband, taken her daughter Jane, and set out to start a new life in a strange city, despite the stigma of being a woman on her own. She was a mother, a hard-worker, a strong spirit, and a painter above all else, brushing her soul onto canvas every day. Her art was beautiful, depicting desperate children with gigantic eyes, looking into the souls of the forgotten and perhaps finding hope. But her work didn’t sell, no one bought from women, and her style was so incredibly odd that there was no definition for it. So art became a hobby, Margaret did caricatures on the side, and her dream was buried deep. Until the day an incredibly vivacious man named Walter Keane stepped into the picture. He was a born salesman, a loud talker, full of stories, passion, and apparent insight. He saw potential in Margaret’s paintings, and, being an artist himself, was a kindred spirit. The two fell in love and got married, providing Margaret with protection from her ex-husband and the stability of a normal home. When Walter began selling Margaret’s art to patrons, everything seemed to be taking off, but there was one catch; he had started claiming the work as his own. No matter, people were buying, what did it matter which Keane was actually responsible for the paintings? But as time went on and the secret became too much to bear, Walter became a domineering master of the empire, while Margaret became a prisoner of her own talent, locked away voluntarily to produce art that fueled her husband’s fame. That this story is absolutely true is a fact that’s hard to accept. It all seems so utterly ridiculous; a woman painting for her husband, keeping the truth hidden from the whole world, while he grew into one of the most prominent American artists of the 20th century. But it’s all real; the humble beginnings, the rise in popularity, the mass production of pop art, the masterpiece at the World’s Fair, and even the court case that ultimately told the world the truth. It’s a wild & unbelievable tale, one that must have been a joy to tell, a fascinating story to research. And the true base helps when the plot seems to go a bit over-the-top, because it forces the audience to remind itself that this all happened, that the ultimate pseudonym was crafted to sell art in a time when there seemed to be little alternative. I can see why the Academy was unimpressed by this film. Or, more specifically, how someone could see it as good but not award-worthy. That seems to be the common opinion, and it’s one I hold as well. The story tells itself, with little help needed from the director or the cast. Tim Burton’s influence is only felt slightly, which I guess should be to his credit, since his usual dark style would not have fit this plot at all. 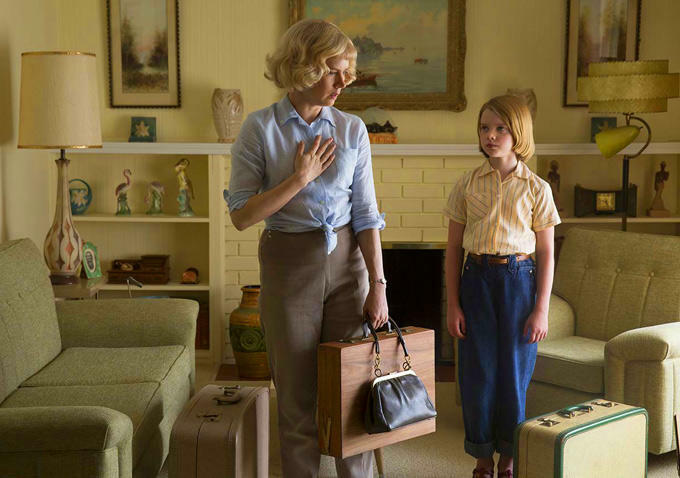 Amy Adams was fine, but she’s much better playing a strong character, not a push-over or a weak-willed woman. Both girls that played Jane were absolutely terrible, which I’m sure made Adam’s job harder. And it was Christoph Waltz who really made the film with his portrayal of Walter Keane. He was intense, slimy, despicable, a used car salesman who you loved to hate. When the action picked up at the end so did the film, but by then it had solidified itself as a interesting story well-told, not an individual piece of stellar cinema. Video – With an aspect ratio of 1.78:1 Widescreen 1080p, the video quality is just about as good as you are going to get. The film was shot using Arri Alexa cameras, delivering a visually stunning picture, with perfect clarity. The color jumps off the screen with a vibrance that is absolutely stunning, as Burton uses a lot of bright hues to capture the art of the everyday as well as the Keane paintings. Audio – The Blu-ray was done in English 5.1 DTSHD-MA, with an option for Spanish 5.1 Dolby Digital. The film can be viewed with English for the hearing impaired or with Spanish subtitles. The audio quality is top notch, with a nice use of music and effect that compliment the action. I felt, as I often do with Blu-ray films, that the dialogue was remarkably quiet compared with the background sound, creating a balance that I never enjoy but can’t complain about too much since so many others enjoy the intensity of the Blu-ray audio. Extras – The only extras on the disc are a 21-minute Making of Big Eyes segment and a 33-minute Q&A Highlight reel. Recommended. 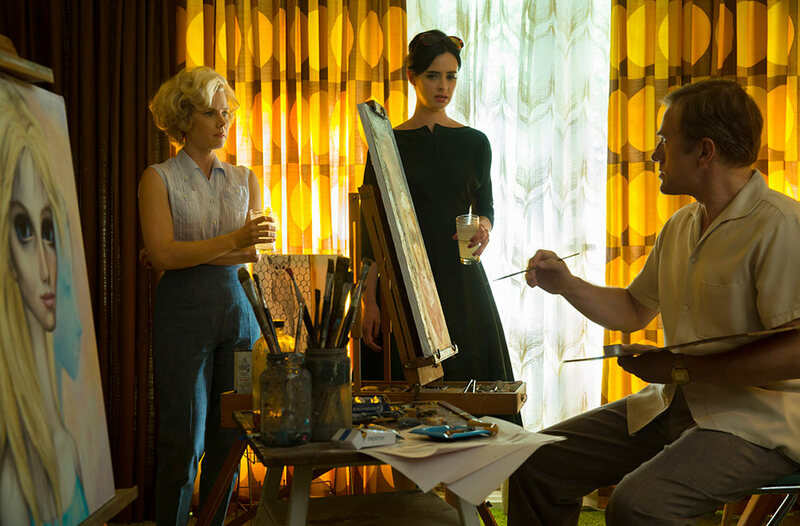 The worst thing that can be said about Big Eyes is that it’s not quite Oscar-worthy. This might be a disappointment to those expecting brilliance, but could also be taken as a compliment, since the film is great enough to enter the conversation at all. It’s a story well-told with a talented crew producing the picture, but without a magical quality to set it apart from the crowd. The direction and acting are fine, the true story element is fascinating, and the film is well-made. It just falls a bit short of special, but it can’t be called terrible either. The video is beautiful, the audio strong, and the extras few. This is a movie that should be watched, but doesn’t warrant the top of your list.